In sponsorship with JOIE DE VIVRE, We bring you the Summer X Anniversary Giveaway. We will give exciting summer giveaways! 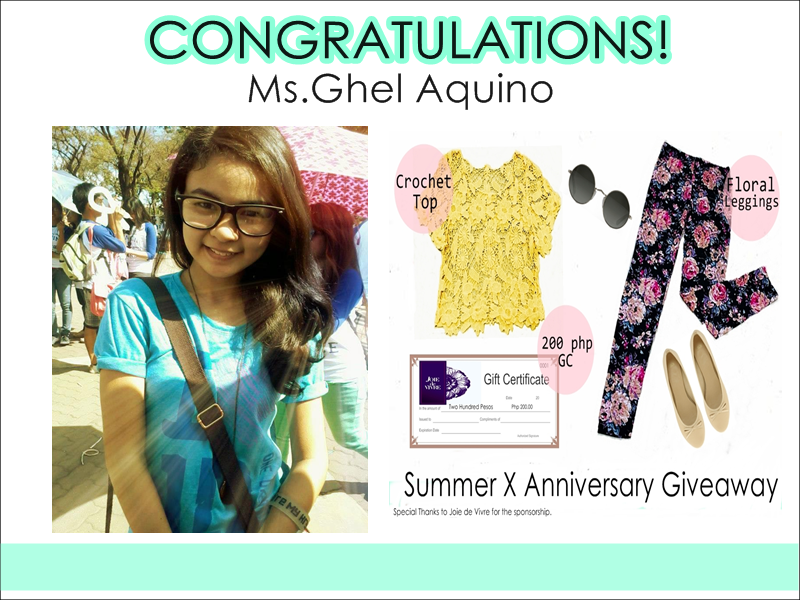 One lucky winner will get a crochet top,a floral leggings and a 200 pesos worth of gift certificate. Isn't that exciting!! Join and win this fabulous prizes just by following this easy steps! 2.Hover over the liked button and click "add to interest lists"
I love JDV,followed by your name,fb username. *Make sure your post is public so we can validate entries. *Get 3 or more friends to like our pages,and your entries will be doubled! *For multiple entries,repeat steps 3 and 6.
a day before Joie de Vivre will have their anniversary! and will be announced on April 28,2013 at 9pm via FB and bloposts. Join and let's celebrate summer and Joie de Vivre's Anniversary!! Winner was drawn last April 27,2013 at 9pm via random.org by a third party. Winner can claim their prize by leaving a personal message via facebook page JAQUI PEREZ.